Homes That Need Less Heating …. Passivhaus is a standard of build quality, first created in Germany, with the aim to have extremely energy efficient houses that have a pleasant internal temperature without a traditional heating or cooling system. Instead these buildings heat and cool utilising warmth from the inhabitants, appliances, the sun or extracted air. There were approximately 25,000 houses at this standard in the whole world in August 2010 (Wikipedia), the majority of which are in Germany, the home of Passivhaus. How to achieve a Passive House? To put it simply, a Passive House will have extremely high levels of insulation, high performance, energy efficient windows with insulated frames, airtight building materials and a mechanical ventilation system that recovers heat efficiently. The airtightness and ventilation system allows a house to be warm in winter, but cool in summer without using electricity to create this pleasant ambience. So, this means the building itself has thick insulation and uses solar gains, gathering heat through the windows, walls and floors during winter and rejecting it in summer. It has to be built with good ventilation because it is an airtight building, you need a constant circulation of fresh air, without losing heat. It is not just the house that makes it a Passivhaus; it is the appliances and lights too. These should be low energy. The house shouldn’t need to use much electricity, but the majority of its energy needs should be supplied by natural energy flow, such as photovoltaic solar panels. 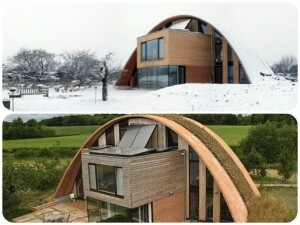 Why create your own Passive House? The obvious reason is the massive savings to be had on energy bills! Building a Passive House will cost 3-8% more than a normal new build according to the International Passive House Association, but when you are achieving a 75% reduction in space heating requirements (according to Passivhaus Trust), it makes up for the extra costs, as the house heats itself. Energy saved means carbon saved, so if you’re concerned about the planet as well as your wallet you’ll be pleased to know the majority of energy needs are met with low or neutral carbon methods. As the house is airtight, gone are the days of ghastly draughts around your ankles and another benefit of this is the lack of pollen in the air; if you’re a hay-fever sufferer, the filters will prevent pollen entering your home. 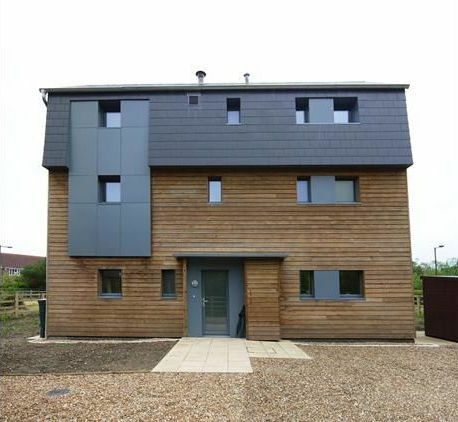 Here are a few Passive Houses from across the UK. They are not necessarily traditional house designs, but they incorporate lots of different building methods and unusual ways to insulate the property. They are also made to blend into the natural surroundings, aiming not to stick out like a sore thumb. Earthship, Brighton (Image sourced from Wikipedia). Made using tyres filled with earth and the earth basically enveloping, this home is well insulated and lets light pour in from the front of the house. This is a Passive House in Scotland (Image sourced from Wikipedia). As you can see it has a very different design to the one in Brighton. It has quite a Scandinavian feel with the timber, balconies and small upstairs windows. 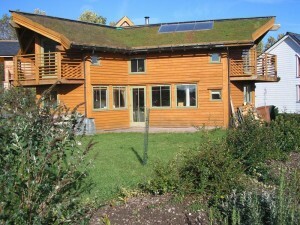 It has some similarities to the house in Brighton though with the turfed roof; grass and soil acts as a great insulator! These Passive Houses in Oldham (Image sourced from The Guardian) were built to help the local residents save money on energy bills as they continue to rise in cost. It is quite scary to think that this winter some people will be choosing between heating and other necessities, so these houses are a welcome investment. 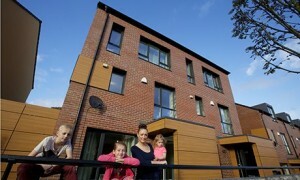 There are 20,000 homes in Oldham alone that are in fuel poverty, so putting money into Passive Houses should help keep people warm for years to come. Milton Keynes Passive House (Image sourced from architectsjournal.co.uk) has similar aesthetics to the Scottish Passive House, but has been branded the most air tight building in the UK by Architects Journal. I love how it reminds me of a barn, but the slate upper floor and the windows complete the modern look of the building. 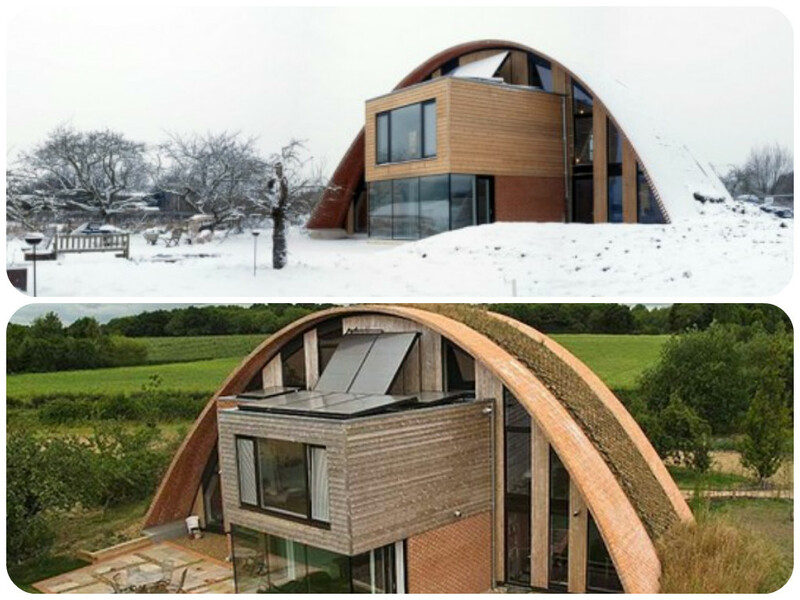 This was the first Passive House to be built in England, sporting an unusual turfed, arched roof. This home in Kent was designed by Richard Hawke, using state of the art technology and building methods to create a stunning house. I love this house, which has utilised windows to the max for the front of the house, letting light flood in. The anthracite grey finish of the windows completes the modern look and looks fantastic in contrast with the timber build.